Radiator Blog: Butte, Montana. 1973; a board game about open-pit mining. Butte, Montana. 1973; a board game about open-pit mining. It's an art board game (or board art game? or bored art game?) about open-pit mining. 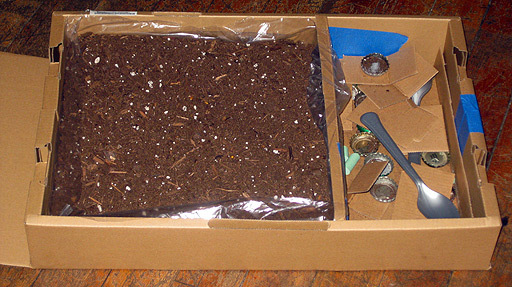 And it's a box of dirt. It's not terribly interesting as a "game qua game" -- if you want that, go play Catan or Call of Honor or something -- but it's an attempt at wondering what else one can do with a game. It also made me realize that video game designers should be forced to make analog games more often. Generally, I believe that game architecture shapes player narratives to create dynamic narrative. Dynamic means something changes from playthrough to playthrough or player to player, while static means it doesn't. Now, if architecture shapes your experience of narrative and we want a dynamic narrative, that means we need a dynamic architecture. [insert paragraph you've already read 100 times before about how Minecraft is awesome, etc.] In a board game context, that means the act of modifying the game board should be part of the core gameplay and interaction. This interaction changes the nature of play -- maybe not a lot, but still enough to be interesting, I argue. A problem with traditional models of dynamic narrative, I think, is a clear delineation between the developer-authored narrative and a player-generated narrative; maybe they should be mixed, mingled and engaging in filthy sexual congress with each other until you can't tell where it begins and ends. Did you imagine that plot event? Did the author imply that, or are you bringing a part of yourself into it? 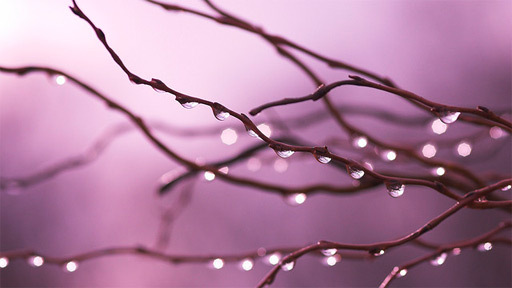 The holy grail of narrative is NOT a bunch of branching narrative -- rather, the problem is in the nature of branching narrative itself, that these branches are discrete paths. And as we all know, discrete choices are only suited for one kind of interaction. (See: immersive sims, analog interaction vs. discrete interaction) Instead of branching narrative, maybe we should go for bushy narrative or electron-cloud narrative. We already know the decapitated Statue of Liberty in Deus Ex can tell a story; perhaps I want to know if a building can tell me a poem. In that vein, "Butte, Montana. 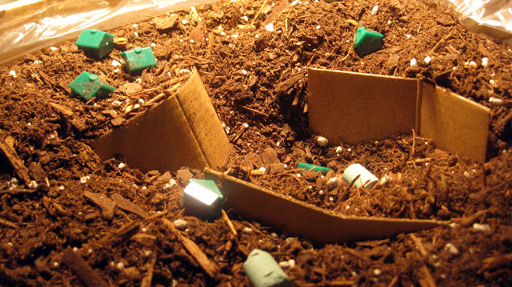 1973" is a game where you dig around in a box of dirt. Mining is construed as a form of re-shaping the environment, a form of architecture. In regards to open-pit mining, the different tiers / rock layers are called "benches" -- and when you mine, you create these benches and other structures. The gist of the game: Player 2 (P2) digs for pennies previously buried by Player 1 (P1). In doing so, P2 can pay pennies to have P1's houses moved out of the way so P2 can dig underneath. P1 wins by keeping pennies hidden / houses intact. P2 wins by finding pennies using their limited number of digs. This gameplay allows for fake-outs and deceptions -- did P1 put houses in the middle because there are pennies underneath, or did they want to preserve their houses? Will P2 remove houses out of spite? Thus, you can understand P2 as the Anaconda Mining Co. who actually did remove peoples' houses in real-life in order to expand the copper mine, and P1 as the town of Butte, though I never really label them as such. Your in-game actions already create your player character. The winning player (likely to be P2, the mining company) gets to pour "spring rain" from a pitcher. The rain will form lakes, depending on the holes and pits that P2 dug in their search for pennies. Maybe some houses will fall in, maybe there won't be a lake at all, maybe all the carefully constructed benches will dissolve into mudslides. ... But this liquid is actually diluted hydrochloric acid (which I discovered you can purchase at hardware stores) that will react with the baking soda I've mixed-in with the soil, the pennies made of zinc and the chalk tokens that represent chemical residue from mining. The result is a giant foaming / steaming / frothing mess of acidic mud, seeping through the box and all over the floor. How the hell do you clean that up? 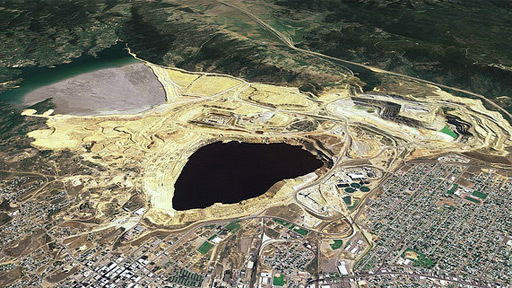 That's the question being asked in Butte, Montana, at the Berkeley Pit, a former open-pit copper mine / current toxic lake with a pH of 2 / one of the largest Superfund sites in the nation. Notoriously, a flock of geese landed on the surface and died from acid burns. It's even possible to mine chemicals directly from the water. In short, it's pretty bad over there. Gawking at that ending spectacle of a box full of foaming acidic mud? Your fellow player smashing the glass of the window with a hammer? Some of my classmates didn't want to play because they didn't want to touch the dirt -- can a video game get that kind of reaction? That's all special behavior that takes place in the context of the real-world, not the two-dimensional safety of a screen. It makes me look at video games and think, "Ugh, this medium is so limiting..."